“I am not my illness,” screamed the meme in my newsfeed this morning. I have seen this pronouncement perhaps thousands of times since my diagnosis, and yet, it still makes me uneasy. Though it sounds reasonable and even empowering at first glance, upon further reflection I am not sure I fully endorse the essence and implications of the statement. Perhaps I lack understanding. Perhaps the meaning behind such a declaration is that one is more than just one’s illness. After all, we do not lose our talents and interests upon falling ill. We are still human beings who have family, friends, jobs and hobbies. We focus on aspects of life beyond our disease – learning new subjects and skills, raising children, celebrating significant milestones and events, attending church, enjoying festivities and a whole host of other such ventures. If this is the essence of the statement, then I take no issue with it, and would, in fact, endorse it wholeheartedly. But if it means or is used to imply, instead, that one is not affected by one’s illness – that sickness should or can be ignored or controlled, and that if we were simply strong enough and committed enough, if we thought positively enough or did not alter our routines one iota, our lives would not be distorted by chronic illness in the slightest. If this is the intended meaning, then I find this declaration both disturbing and harmful. I am here to tell you that I am my illness. It is a part of me, and I am a part of it. I am chained to it, often controlled by it, and am keenly aware that it is never going away. It defines me – at least in large part – and I am not ashamed of that. It has changed me, every part of me. It has shaped me and given me purpose. I detest it and would gladly rid myself of it in an instant if I could, but at the same time, I owe it recognition for the way in which it has made me realize how precious life and all the struggling beings around me are. I am a person whose life has been forever altered by a chronic illness, but I am not weak-willed or powerless, and I will not be silenced. I am not embarrassed of nor apologetic for my illness, and I will not allow anyone to make me feel as if I should be. I exist. My illness exists. And I will shout it from the rooftops if that is what is needed to bring awareness to it. It is me, and I am it – and to say otherwise is to deny reality. 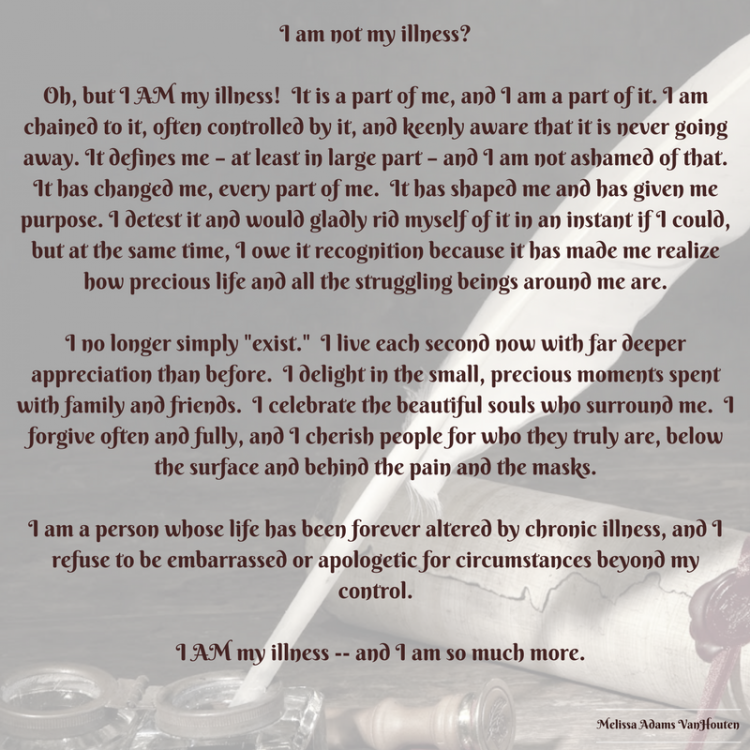 I am my illness – and yet, I am so much more. Melissa was diagnosed with gastroparesis, a life-altering digestive and motility disorder, in February of 2014. She has been fighting for awareness of this devastating disease since then.